On Saturday, December 3rd at noon, Craig Kausen, the grandson of animator and Oscar-winning director Chuck Jones, will give a special presentation in the Music Room of the Colorado Springs Fine Art Center where he will discuss his grandfather’s work.During the “Golden Age” of animation, Chuck Jones helped bring to life many of Warner Bros.’ most famous characters and created characters such as Road Runner, Wile E. Coyote, Marvin Martian, Pepe le Pew, and many others. 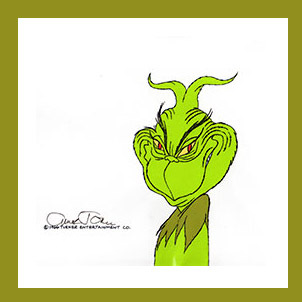 Jones also directed the 1966 television special, How the Grinch Stole Christmas. After the talk, join collector Bill Heeter in the galleries to learn more about his private collection of original animation cels and ephemera. Please RSVP for this event, as there is limited seating, by emailing boxoffice@csfineartscenter.org or calling 719.477.4310. For more information about the exhibit and the Colorado Springs Fine Art Center, click here. Last fall, Craig Kausen, chairman of the Center and Chuck's grandson, was honored to be asked to deliver the commencement address at the Art Institute of California--Orange County to their graduating class in December. Working from the merest framework and extemporaneously, Craig touched on the following points that both encouraged the graduates and exemplified the life they could lead as they headed out into the world. "What I learned with Chuck Jones as my grandfather." He relayed the story of when Chuck was producing and directing "The White Seal" he realized that seals and humans have remarkable similar skeletal structures. So Chuck, one afternoon, tied Craig's and his brother Todd's arms to their sides, along with tieing their legs together and tossed them in the pool so he could draw them as if they were seals. You can watch a recreation of that moment on YouTube by clicking here. "Sometimes you may be intimidated by those around you." Craig offered that you can potentially reframe your perspective and overcome this internal adversity. I learned a different view of success from Chuck. Although one of most acclaimed animation film directors in history, he saw success as part of the jouney. Chuck said, "I can receive an Academy Award and I say 'Thank you,' but then I put it back on the shelf and think, "what's next?" "Life is a contact sport." The journey is not always easy, but how you see it is the key to moving forward. And if ever there is a choice in two paths that seem equally likely to get you to where you want to be . . . take the one that is more fun. Craig closed out his address with two words to live by every day of their lives: "ENJOY IT!" Because if you do, no matter the outcome, you'll always, always, always be a success.